Just a brief comment to mark an appalling but completely predictable event: the World Socialist Web Site, run by the dubiously named ‘Socialist’ Equality Party, has come out in support of the Supreme Court’s Janus decision last week stripping unions of the agency shop. The SEP has now lined up not only with the Court’s black-robed reactionaries but also with the sinister cabal of right-wing think tanks and billionaires including the Koch brothers who provided the funding to push this legal case. In so doing the SEP has crossed a class line and come out openly in support of a dangerous assault on the rights of workers. The logic of the SEP’s argument is spurious. To believe them, the Supreme Court decision was “a defeat for the union bureaucracy, not the workers.” Who knew that the Court was so solicitous of the rights of workers and so careful to distinguish them from union bureaucrats? What rubbish! This decision was deliberately designed to undermine and ultimately break up the last remaining bastion of union strength in the public sector. And there is SEP cheering it on! Here a few basic points are in order. Socialist workers oppose the labor bureaucracy but that does not mean that we abandon the unions. To the extent that there remain significant numbers of workers in the unions and to the extent that those workers retain important rights and benefits from union membership - to that extent socialists fight to defend those rights by offering an alternative leadership committed to socialist policies. If socialists abandon the unions, they also abandon any fight to defend rights like decent health coverage, a living wage, pensions, paid vacations, pregnancy and sick leave. Why should workers have anything but contempt for such ‘socialists’? All unions are NOT company unions, SEP propaganda notwithstanding. It is true that in the private sector, many unions have disintegrated while others have degenerated, sometimes beyond the point of no return. But in the public sector the picture is quite different, especially in blue states, where there are millions of unionized public sector workers. The rights and gains these workers have made are not fictions - and the best proof of that is the relentless anti-union hostility of the billionaires and right-wing ideologues behind the Janus decision. Why would they care a damn if those gains were non-existent? As for the recent upsurge of teachers’ strikes in red states, it is true that the impetus for those strikes often came from teachers outside the unions. But these teachers weren’t abandoning unions; on the contrary, they wanted more unionization and above all MORE MILITANT unions. The standpoint of socialists should be to show them how this can be possible only through new leadership. Finally, a word about the agency shop, the subject of the Janus ruling. This is a descendant of the closed shop, one of the crucial demands of the mass struggles for CIO industrial unions in the 1930s. Without the closed shop, the union couldn’t survive, as workers came to understand. Only bosses and scabs were against the closed shop. The agency shop was already a watered-down version of this, a sliver of legality the Supreme Court was still willing to grant in a very different political climate four decades ago. Workers didn’t have to join a union, but if that union negotiated for them, they had to contribute dues to help pay for that. Now that sliver of legality is gone, and the Koch brothers machine is already mass texting union members to encourage them to withdraw their dues, with the aim of starving the unions to the point of financial collapse. By the logic of its politics, the SEP should be entirely in support of this campaign. Maybe they can offer the Koch brothers a helping hand. Enough said! In times when political tensions are acute, one’s true political colors come into the open. The sectarian turns out to be a reactionary. The key to understanding this is the sectarian’s relationship - or non-relationship - to the working class. A socialist party that abandons any ties to the working class has lost its moorings politically. It doesn’t matter how ‘revolutionary’ its rhetoric is, because rhetoric is no substitute for a political engagement on a daily basis with the working class. The SEP abandoned any such engagement decades ago. North’s pronouncements about unions were a (not very convincing) theoretical cover for that abandonment. Instead the party withdrew into an internet existence and appealed mostly to college students (particularly, it would seem, to up-and-coming lawyers). The working class was constantly invoked in its propaganda, but this had nothing to do with the actual working class, it was purely an exercise in wishful thinking - a sectarian’s imaginary projection of what the working class should be. Also, the party had no need to raise funds in the working class, as had long been the tradition in the socialist movement, because North was able to finance his operations by running a lucrative printing business. This had the added benefit for North of reinforcing his political control, since he not only got to set the political agenda but also controlled the purse strings. The upshot of all this is a cult-like outfit where all resolutions are passed ‘unanimously’. A party this politically unmoored from the working class has little resistance to being pushed in reactionary directions. Nothing good can come from such a party. If there is anyone left in that party who still holds any allegiance to the working class, the best thing to do is: Get out! "A socialist party that abandons any ties to the working class has lost its moorings politically." This is certainly true. However, you seem here to equate the working class with the trade union bureaucracy. Where have unions led revolutions? Spain had a powerful Syndicalist tradition with unions that had their own militias, they failed. In 1952 Bolivian Trotskyists had great influence on the Tin miners, the most radical workers anywhere in the Americas, did they seize power? Why not? What happened in Sri Lanka, another nation where Trotskysists had a mass base in unions? So many questions and so few answers from you and the WSWS. This article of theirs marks a qualitative change for the SEP. While they have steadfastly decried the union bureaucracy (and rightly) for decades now, they have turned against unions qua unions in recent times; in their race to denounce "unions" failing to distinguish between bureaucracy on the one hand, and on the other hand union members who do still have - however flawed - and it *is* flawed - bargaining power within trade unions, and who will be affected most heavily by this recent ruling. The record of concessions contracts pushed on many union rank and file members by the bureaucracy over the past years is certainly testament to the unstable nature of these organizations as they are structured now. That is certainly to be fought against, and the SEP had written much of those contracts, providing valuable documenting of the machinations of the UAW bureaucracy, for instance. It is one thing to say (which the SEP often does) that the working class should "form rank and file committees" - sure - and then what? Be fired as a group? They have not built leadership within the union ranks, have not moved to replace the union bureaucracy with leadership from the shop floor. Have certainly not called with any seriousness for the expropriation of GM, say, nor any other shop, to be put under workers' control. But they do cheer the recent ruling - by a bourgeois court - which runs in favor of the boards of directors and owners, and against the interests of the working class. One has to wonder if, were they receiving union contributions, the SEP would be so joyous at this outcome? I reread the criticism of the SEP's trade union policy, specifically, as it pertains to the 2005 MTA workers' strike penned by Steiner. Thirteen years later, what has Steiner built in that union? The standard 'Trotskist' criticism is to always find a bogeyman to explain why they are unable to carry out their stated mission. It's always the Stalinists' or Revisionists' fault, but they never get around to explaining why what they were doing didn't work. Why has the Permanent Revolution crew been as absent as the SEP in the struggles of the working class? Or am I wrong? If I am, please state what you've done for over a decade since you wrote your criticism, that has worked or failed, that would be more useful than another " the other guy screwed up again" that has been the standard excuse since 1938. This diatribe against the SEP reminds one of the denunciations of "Trotzkyite wreckers" by the Stalinists. You call for members to leave the SWP. Trotsky called for a break with the Third International over the betrayal of the German working class. You repeat your longstanding call for the destruction of the SEP over ... the dues checkoff system! "The character of a workers’ organization such as a trade union is determined by its relation to the distribution of national income. The fact that Green and Company defend private property in the means of production characterizes them as bourgeois. 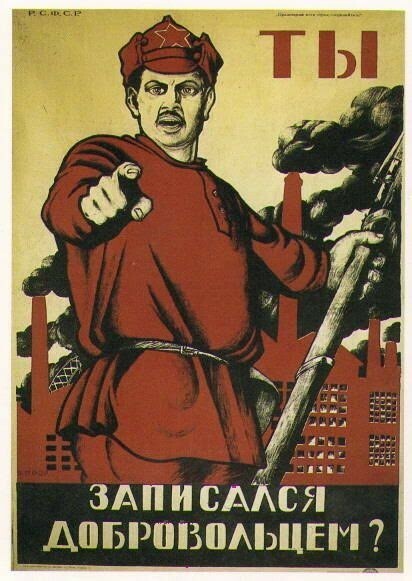 Should these gentlemen in addition defend the income of the bourgeoisie from attacks on the part of the workers; should they conduct a struggle against strikes, against the raising of wages, against help to the unemployed; then we would have an organization of scabs, and not a trade union." For decades (and not merely a few years) the AFL-CIO has defended the income of the bourgeoisie from attacks on the part of the workers; they have conducted a struggle against strikes, against the raising of wages, against help to the unemployed. This makes them, as Trotsky wrote, scabs. You are defending the scabs against the workers. You are overstating the case. The unions' corporatist degeneration is very real but it is factually wrong to claim they are purely scab organizations. Even after decades of sellouts and defeats, BLS data still shows that unionized workers get a significantly better deal (higher wages, better benefits) than their non-union counterparts. Your take also glaringly fails to explain the fanatical anti-union attitude of big business, even from companies (like Amazon) that are politically aligned with the Democrats. If we can say with certainty that unions do nothing but struggle against strikes and higher wages, why are workers regularly fired for trying to unionize their workplaces? Why do major corporations spend vast sums on anti-union propaganda and fight tooth and nail to prevent unionization? In the Janus case in particular, the process and context matters. Even if we accept the very dubious argument that banning the agency shop is a good thing for the working class, it was achieved not by an initiative and activism by the workers from below but via a legal case brought by corporate-financed right-wing activists and endorsed by the most reactionary wing of the capitalist Supreme Court. You don't need to be an apologist for the union bureaucracy to oppose textbook union-busting from above, which Janus was a clear example of. the working class, the best thing to do is: Get out!" position on Janus marks a "qualitative change for the SEP."
corporations on behalf of the union bureaucracy, from workers' paycheck? they should financially support the organization? unions will aggressively represent the interest of workers? 40 years due to struggles led by unions? emergence of more militant factions among the workers? scabs. Why does this definition not apply to the AFL-CIO? should be compelled to pay dues to this organization? ruling bureaucracy, how do you think the union leadership would respond? I look forward to your answers. The question of the unions is a complicated one. What you have not done in this article is engage with the fundamental point of Marxist theory that WSWS makes, which is in their analysis of globalization. The SEP's conclusion about the unions no longer being working-class organizations is bound up with and follows from the analysis of globalization. See especially Nick Beams "The Significance and Implications of Globalization: A Marxist Perspective." This sets out why unions - as nationally based and oriented organizations - cannot - due to the limitations of their very structure - represent the working class in an era of globalized production. If you are going to critique the SEP's position on the unions, you have to engage with this argument, otherwise your critique is superficial. It may be that public sector unions still are able to defend some minimal rights given that these workplaces are not so subject to the pressures of globalization. But, I'm not convinced that this makes them working-class organizations. The most important point though is that the SEP's position on unions is based on a Marxist analysis of globalization, which is a sincere and cogent application of Marxist theorizing to the present. It's a Marxist argument. It's not an anti-working class position. Your critique is essentially: to be anti-union is to be anti-working class. That may have been the case in the 1960s, but there are good reasons as set out in WSWS for thinking that is no longer the case. Revolutionary hostility to the unions based on their nationalist and (now hardly even) reformist character is something that has a strong Marxist pedigree. It seems to me your critique of the SEP on this is superficial and not convincing. (This is while thinking that you make much better arguments regarding MeToo). "Funded by the most right-wing and anti-working class forces—including billionaire Richard DeVos and the Koch Brothers—the measure bans collective bargaining agreements that require workers to pay dues or fees to unions as a condition of employment. By instituting what is in effect an open shop requirement for all public and private-sector workplaces, the corporate backers of the legislation hope to remove any restrictions on their exploitation of labor." A year later an article on this exact issue (called "Lawsuit in California targets workers’ rights") described the "ultimate target" of these measures as "the democratic rights of the working class." Another (2014) calls RTW laws an attempt to "undermine traditional labor protections and block any form of collective resistance by workers to the dictates of management." Now, without any explanation, the line is suddenly that these "right-wing and anti-working class forces" are aligned with the interests of the working class, that a cabal of unelected, fanatically pro-business judges striking down long-established union rights is not at all cause for concern, and that "anti-worker" RTW laws "aimed at blocking any collective resistance to the corporations" (WSWS, 2015) should either go unopposed or be actively celebrated. And the final paragraphs of the article state: “In other words, these personal assistants were forced to pay dues to a union that did little for them besides taking their money, which was then used to line the pockets of union bureaucrats and oil the corrupt Chicago Democratic Party machine. Contrary to “Anonymous'” claim, the position taken in 2014 is identical to that taken in the recent Janus decision. Citing a WSWS article from 2015, they include only the words "aimed at blocking any collective resistance to the corporations". As for the reference to the 2012 law passed by the Michigan state legislature, the SEP opposed it, in line with its principled opposition to all corporatist labor law legislation, whether introduced by Democrats or Republicans. It should be noted that the unions threatened massive electoral retaliation against the Republicans in the 2014 Michigan state elections. That threat came to nothing. Workers ignored the union bureaucracy's appeal for a portion of their wages. The Republicans gained seats in 2014. One final point: the institution of the dues checkoff was never a demand raised by militant, let alone revolutionary socialist, workers. Why would they want to provide the union bureaucracy with a guaranteed income that effectively frees them from rank and file control? The dues checkoff was instituted by the Roosevelt administration in the 1940s, in order to incorporate the union bureaucracy into the war effort and guarantee its enforcement of the “No Strike” Pledge. Excellent response by Eric London. It makes total sense that the dues checkoff was part of the wartime institutionalization of the unions as bureaucratic bargaining agents and means for regulating labor. It sounds like you're confusing the issues here. The real question isn't the specific way that dues are paid (the dues checkoff) but the right of unions to impose mandatory dues or fees in general. 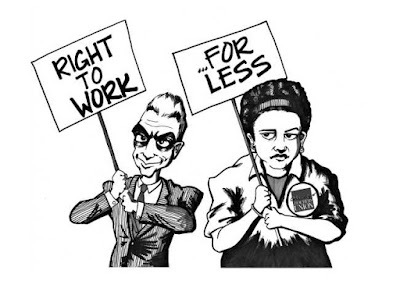 Right to Work laws and court rulings by definition attack that broader right. They legally mandate 'open shops' and prohibit agency or union shops, i.e. workplaces where being a union member or financially supporting a union in some way is a condition for employment. This was the issue at stake in the outcome of Janus and many other pro-business RTW initiatives. I don't disagree with many of your points on the dues checkoff in particular, but Janus' lawsuit was not brought by a rank-and-file militant trying to start a dues strike against the UAW. It was expressly motivated by a right-wing ideological hostility towards the basic right of workers to organize and bargain collectively. That said, your own organization's website very clearly answers your questions about Right to Work. Again and again, they've described the attempts by courts and capitalist politicians to prohibit unions from requiring dues as a broader attack on the rights of workers to organize and defend themselves collectively against big business. You don't offer any explanation at all for why they described these policies in this way, why they opposed RTW measures in the past but support them now and, in a nice bit of doublethink, don't bother trying to reconcile these past positions with your current views. How is it that initiatives prohibiting unions from imposing dues or fees were clearly opposed as "part of an effort by the American ruling class to roll back gains won by workers over decades of bitter struggle" in 2012, but in 2018 are being welcomed as "a defeat for the union bureaucracy, not the workers"? The best you seem to be able to come up with is to produce a quote from one of the articles criticizing the unions. What's your point? Opposing the unions has never meant endorsing ruling class assaults on the larger legal rights of trade unions and collective bargaining. Until the SEP's Janus statement, where criticism of Right to Work disappeared completely and was replaced by arguments in favor, many of their articles clearly made that distinction. From "The trade unions and Michigan's 'right to work' law" for example: "Our principled opposition to the law, however, in no way implies support for the organizations that are its immediate target—the official trade unions." Again in "Lawsuit in California targets workers' rights": "The Socialist Equality Party’s opposition to the lawsuit [targeting the agency shop rule] in no way implies support for the unions or those who control them." As far as history goes you are misinformed. Early 20th century union militants regularly went much further than the modern agency shop and fought for union or closed shops (since banned by Taft-Hartley), where workers were not only required to pay dues but to be members of the union in good standing in order to work. The Trotskyist-led 1934 Teamsters strike, where a closed shop was one of the demands, is one example. Most state Right to Work laws were also passed in the late 1940s and were denounced by the Socialist Workers Party at the time, despite the fact that the unions had by then been institutionalized as part of the post-war capitalist setup and had purged most militants and radicals. The extreme limits of trade unionism were no secret, but it was also understood that ruling class attacks on the unions and organizing rights (like Alito's Janus ruling today) were not some kind of blunt instrument that could be wielded in the interests of the workers. Anonymous has still not answered the questions that I posed in an earlier post. Instead, he/she employs the term “union” as an abstract word form totally devoid of any historical or social content. Absurdly, he invokes the Teamsters 1934 General Strike led by Trotskyists, as if the present-day unions bear any resemblance to the organizations that were engaged in the mass struggles of that long-gone era. What social functions do the existing unions serve? What mass struggles have they been involved in over the past 37 years (i.e., since 1981,when the AFL-CIO sanctioned the destruction of PATCO)? What portion of dues money has been spent over the last 35 years to pay out strike benefits? What services or advantages do workers gain in exchange for their membership dues in the UAW, Teamsters, UMW, etc.? What positive features of the unions of the 1930s, or even of the 1970s, do these organizations retain? What Anonymous, Steiner/Brenner and the pseudo-left are defending are the salaries of the trade union bureaucrats, and their ability to finance the complex network of corporatist relations with management and the capitalist state. I am in general support of the SEP's position on this question. Defending an abstract and sterile concept like "the unions are the defensive organizations of the working class" without thoroughly examining this issue deeply will not lead to anything of educational value. The mainstream American trade unions cannot be reformed. The failed idea of "boring from within" has in effect retarded the possibilities of organizing workers for a struggle against the capitalist system and for revolutionary social change. The prospects of changing the unions via capturing important leadership positions through union elections has as much chance of succeeding as a reform movement of the Catholic Church has in making the church an instrument for ending poverty and abolishing the caste of cardinals and their financial functionaries. If I am not mistaken the number of workers that are union members in the US has dropped to 11%, meaning that 89% of the working class is unorganized. The mainstream unions have done absolutely nothing to even make an attempt to organize this massive number of workers, despite the unions having huge quantities of resources that could be deployed to conduct organizing drives, yet they choose not to. The unions are un-reformable. An example of how truly bad the situation of the unions being bankrupt as a force for defending and organizing the working class is would be the 2011 "Wisconsin Rebellion". At one point 100,000 workers gathered in Madison on a very cold Saturday to oppose the right wing Governor Walker. Many people came from states far from the mid-west, including the both coasts, yet not one organizing drive developed out of this incredible display of working class solidarity. There were many, many unorganized workers that participated in the "rebellion" as a show of support of their union brothers and sisters. Instead of the unions seizing a rare opportunity to organize and fight for the working class they predictably turned the "rebellion" into a vote for a Democratic Party/ Recall Walker diversion. Unfortunately, the masses of protesters were easily misled into the arms of the Democrats, and their creative energy was basically wasted. And what Eric London is failing to do is provide an answer as to why the switch by the SEP from a long history of rightly rejecting "right to work" legislation for a sudden lauding of it in the form of the Janus decision. If anyone is failing to disambiguate between the union bureaucracy and the rank and file in all of this it is surely the SEP with their support for this decision. Yes, the union bureaucracy has a lot to answer for, much of it, as I noted, has been documented by the SEP over the years (and their forerunner the WRP). I would ask, though, what has the SEP done in the way of helping to create rank and file committees or any other unit with collective bargaining rights? How many workers have they attracted *and kept as members* through strike interventions? How have they worked with the rank and file to introduce and expand socialist consciousness within the working class who are members of these unions? Have you advocated infiltrating and taking over the unions, to be run democratically? Pardon my sarcasm on that last one, I know that "no" is the answer to that. What are you proposing for the workers who will suddenly find themselves in positions where the union -pitiful thing that it is, yes - is gone, leaving them with absolutely no protections whatsoever? It is one thing to say, "Oh, hah hah, now the bureaucrat will not be getting paid! ", but you are failing to understand the ramifications for the workers at large in all of this. It's not just the destruction of the corrupt union bureaucracy that is under threat, but the right of collective bargaining itself. All the main points you made about Right To Work were clearly answered, including in very unambiguous terms by your own organization. What parts are still unclear? Again: the right of unions to impose mandatory dues and establish union shop agreements in the workplace is a democratic right of the working class. The efforts to roll back those rights (Taft-Hartley, RTW laws, Janus etc.) by capitalist politicians and judges are an attack on workers at large and the ability of the working class to defend its interests. Instead of dealing honestly with those issues and explaining why the WSWS' approach to them has changed so dramatically, you make it out like there's just no distinction to be made between organizing rights (won by bitter class struggles) and the corporatist unions. Since those legal protections benefit the AFL-CIO they should be gotten rid of, simple as that, and anyone who criticizes the Supreme Court for carrying out this important work can be dismissed as a shill for the union bureaucrats. This point was also answered previously. There's no contradiction in advocating a break with the AFL-CIO and opposing pro-business Right to Work policies. Your own organization made literally this exact point on literally this exact issue in plain language (does it get any clearer than "the SEP's opposition to the lawsuit in no way implies support for the unions"?) just a few years ago. Like I said earlier, RTW lawsuits like Janus aren't directed against the corporatist unions in particular but at the right of any organization to organize workers, impose and collect dues and bargain collectively in the workplace. Your take is a perfect example of throwing out the baby (organizing rights) with the bathwater (the AFL-CIO). It's no different than supporting Republican gerrymandering or attacks on voting rights because the target happens to be the Democratic Party. You also attack me for mentioning the 1934 strike, which I brought up in a paragraph talking about the attitude of socialists and union militants towards the open shop historically. How is what I said 'absurd'? And where did I ever claim or imply that the 1934 Teamsters resemble the modern unions?! Do you think no one can scroll an inch up their computer screen and read what I actually said? Finally, I actually agree with your points on the unions' post-1980 corporatist role. But they're also tangential. A big part of the argument made in favor of Janus isn't specific to developments since PATCO but instead can be applied to the labor movement going all the way back to the passage of the NLRA in the 1930s. By suggesting that compulsory dues or union membership should be opposed as a reactionary limit on the right of workers to protest against the union, the implication is that support for legal bans on agency, union and closed shops is now a matter of socialist principle. 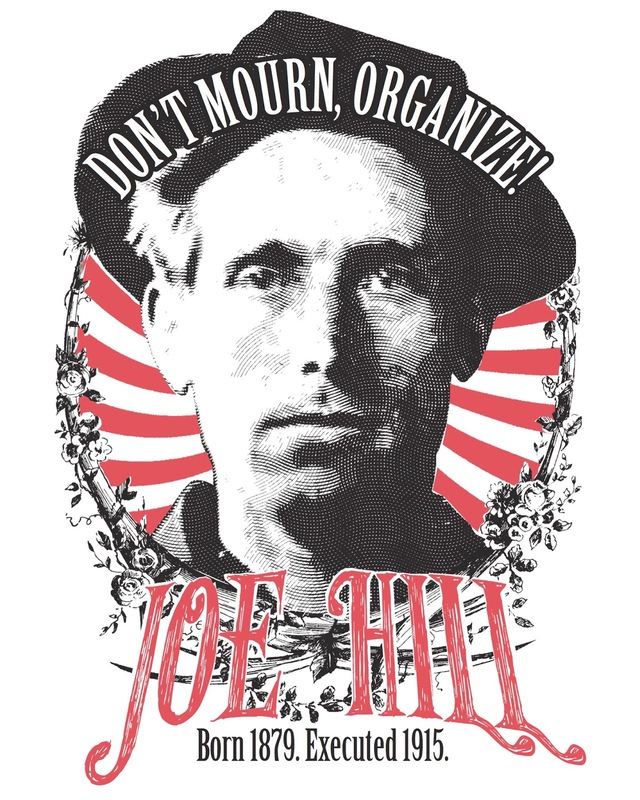 By extension the socialist movement's long history of supporting organizing rights and opposition to Taft-Hartley/Right to Work was a massive blunder. This would obviously be a huge ideological revision but one that would fit with their apparently changing tune on RTW laws, depicted in the Janus statement as just an inter-capitalist squabble that has only positive repercussions for workers. 1. Should socialists support or oppose Right to Work lawsuits and legislation? 2. Why did the WSWS (in line with the historic position of the socialist movement) so clearly oppose these initiatives as an attack on the broader working class until recently, when they morphed into an attack exclusively on the union bureaucracy and not the workers? 3. Is the problem of the corporatist unions going to be solved from above, by rulings and legislation from the extreme right Supreme Court, the Chamber of Commerce and Republican politicians, or below, by the initiative, education and organizing of the workers themselves? Is anything that's bad for the AFL-CIO bureaucrats by definition a good thing for the working class? Listen to broadcast celebrating the 100th anniversary of the October Revolution. The World Socialist Web Site (WSWS) edition of May 17 featured a hysterical diatribe against me by the leader of that organization, David North. Here we are today, 33 years after the split with Healy. Does the fact that North was on the right side of that split confer upon him the legitimacy of a hereditary monarch? Reading North’s comments, one would think that for him the Fourth International is some kind of franchise that he alone can operate. If the continuity of the Fourth International is to have any meaning, other than a ritualistic invocation meant to shore up the flagging morale of one’s followers, it can only be in one’s adherence to the program and theoretical conceptions of the Fourth International. If we examine the political conceptions and organizational practices of the group North has led for all these years it is clear that in all respects it bears little resemblance to the organization Trotsky founded in 1938. It is in fact our exposure of the hollowness of North’s claims to be the inheritor of the mantle of Trotsky that has so infuriated him. Why else would he be spending more time writing about me and Frank Brenner, two individuals, than about the Stalinists, Pabloites and state capitalists? It is tempting to say that 2016 marks the death of liberalism, but that's probably wishful thinking. What is dead, though, is the old 'centrist' political consensus, i.e. the pendulum swings from centre-left to centre-right that made mainstream politics in the West about as predictable (and stable) as an old grandfather clock. Now the swings are much more extreme - or rather the swings to the right are. (One might add that what led up to this was a major shift rightward of the 'center' itself from Reagan/Thatcher on – what Tariq Ali rightly dubbed the “extreme center”. Alex Steiner gave a talk at the Locomotiva Cooperative Cafe in Athens, Greece on July 9, 2015, shortly after the historic vote for NO - OXI -in the Referendum of July 5. The event was a huge success attracting a packed audience of about 50 people. 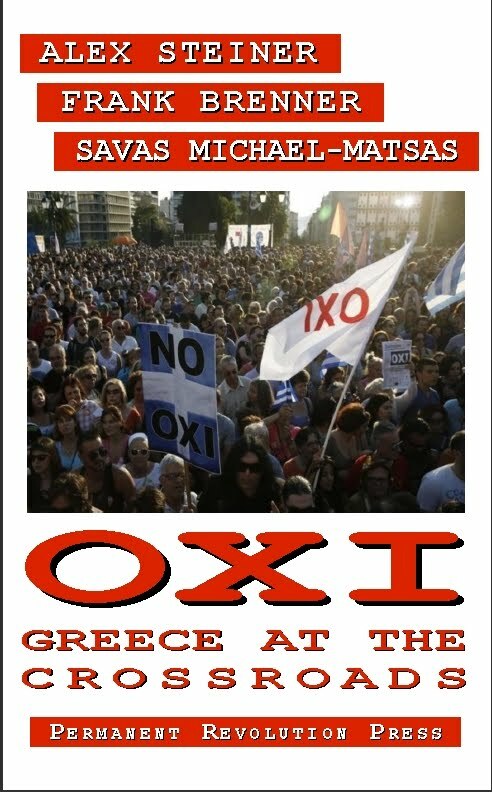 The talk was sponsored by the Workers Revolutionary Party of Greece (EEK) and was chaired by Savas Michael-Matsas. A Greek translation of this talk is now available. The translation was first published in the theoretical journal of the EEK, Revolutionary Marxist Review, in the issue of November 2015-February 2016. The translation was the work of Eve Manopoulou. 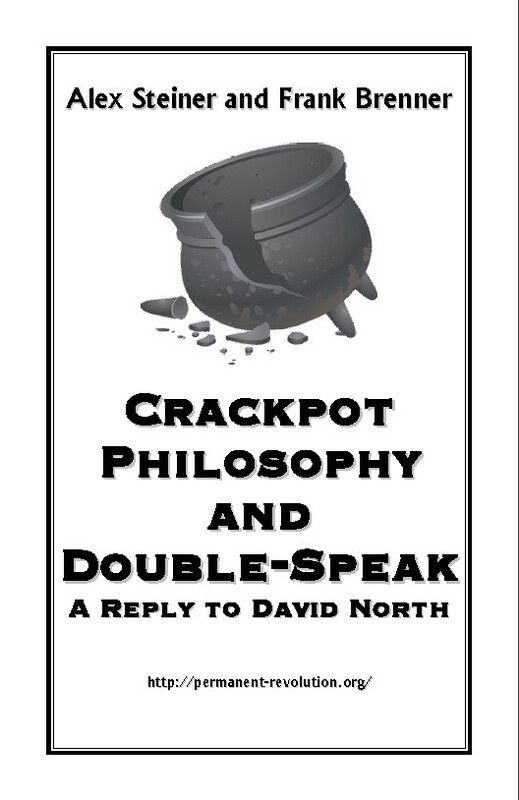 Now available as a PDF, the polemic Crackpot Philosophy and Double-Speak: A Reply to David North. To order click on the button below. The PDF document can be downloaded to your computer, tablet, eReader or smartphone. Delivery is by email so make sure you leave your email address on the order form. Theme images by AndrzejStajer. Powered by Blogger. Permanent Revolution by Alex Steiner and Frank Brenner is licensed under a Creative Commons Attribution-NonCommercial-ShareAlike 4.0 International License.